This is a concise introduction to epidemiology and biostatistics written specifically for medical students and first-time learners of clinical research methods. 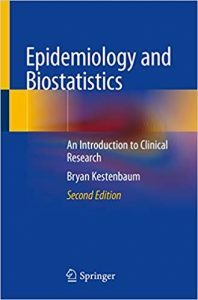 It presents the core concepts of epidemiology and of biostatistics and illustrates them with extensive examples from the clinical literature. It is the only book on the market written to speak directly to medical students and first-time biomedical researchers by using language and examples that are easy to understand. This newly updated second edition is extensively rewritten to provide the clearest explanations and examples. There is also a sister-text, a 150-problem workbook of practice problems that can be purchased alongside this textbook. The author continues to provide a text that is attractively fast-paced and concise for use in condensed courses, such as those taught in medical school. The book is an excellent review for the epidemiology section of the United States Medical Licensing Examination Part I which all medical students must take at the end of the second year.